I guess I can't be too surprised that boys are starting to jump on the makeup bandwagon. I mean we've been having all the fun to ourselves for this whole time - isn't it about time we share? 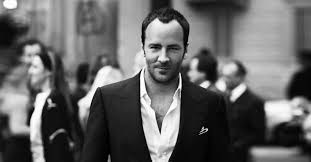 Well, Tom Ford sure thinks so and this gorgeous, yet uber masculine man, admits that he even uses a little bit of the good stuff in his daily routine. Talk about dressing to impress! His up and coming men's skincare line is described as: "This is a serious, high-ticket men's grooming line with a couple of products with cosmetics benefits to be used in a very masculine way." A big believe in moisturizer - hating dry skin and imperfections - this genetically blessed man actually wears bronzer every day, contrary to beliefs that he tans. He also shamelessly dabs some concealer onto problematic facial areas, like so many ladies we know. On one hand, I'm a little scared of all the male glamazons popping up on at the hotspots in town, but then again, a little bit of makeup never hurt anyone, right? The new Tom Ford Men's Skincare line will range from 25$ to 150$ with most products in the 40-60$ range. What do you ladies think? Would you buy this stuff for your special guy?